You can log in, edit and save your application to revisit at any time prior to the ballot commencing. Please ensure you have submitted your application by the relevant date. Once you have submitted your application you will receive an email confirming your ballot requests. If you do not receive this confirmation, please contact the Box Office. Please see our FAQs to help with any queries you may have. Festival Society Members Please ensure you have submitted your application by Saturday 1 December 2018. Associate Members Please ensure you have submitted your application by Friday 18 January 2019. Once you have clicked the link above, please enter your email address and password then click ‘Log In’. If you have forgotten your password, or you have not previously logged in to your online account, please click the forgotten password link. Once logged in, you will be prompted to enter an up-to-date telephone number on which you can be contacted in the case of any queries regarding your application, then click ‘Ticket Selection’ to proceed. Use the buttons at the top of the page to indicate whether you would be happy to be allocated seats in pairs, singles and/or those with restricted view of the stage, including restricted or no view of the supertitles. If you forget to indicate your preferences you will be prompted to select these before proceeding to the next section of the form. To start making your selections, find the production title of your choice and select a date from the drop down menu. Once you have selected a date, you will be able to choose seating areas, prices and the number of tickets required using the drop down menus. A guide to our seating plan and ticket prices can be found in the Members’ brochure. To add or remove a date selection, please use the buttons that read ‘Add alternative date’ or ‘Remove this date’ as required. These appear at the bottom of each date selection. To add another seating option, click the blue ‘Add another seating area’ button which appears next to the seating area you have just selected. 6) Once you have selected your preferences, click the ‘Additional requirements’ button at the bottom of the page to to continue to the next section. Please note, if you have forgotten to fill in any required fields such as number of seats, seating area, price, or you have forgotten to select the ticket preference with the buttons at the top, the form will highlight the missing fields and prompt you to fill these in before proceeding. Please scroll through the form to check the details of any areas highlighted in red. If the problem persists, please contact the Box Office by clicking the ‘Start Chat’ button at the top of the form. If you have any specific access requirements or need to request a wheelchair and companion space, please use the text box on this page to inform us so they can be taken into consideration at the time of allocating. The additional requirements page can also be used to clarify any of your ticket requests or preferences, including consecutive dates. If you wish to make a voluntary donation, please enter the amount in the box provided. By generously making a voluntary donation to the Annual Fund you will be helping to preserve Glyndebourne’s high artistic standards on and off stage. Gifts of £150 or more will be eligible for acknowledgement in the Festival Programme Book. Those who give £1,000 or more will become members of our Ebert Room Club. At this stage you can save the form, by clicking the ‘Save’ button in order to review and make changes at a later date. The ‘Save’ button can be found at the bottom of the ‘Additional requirements’ page. 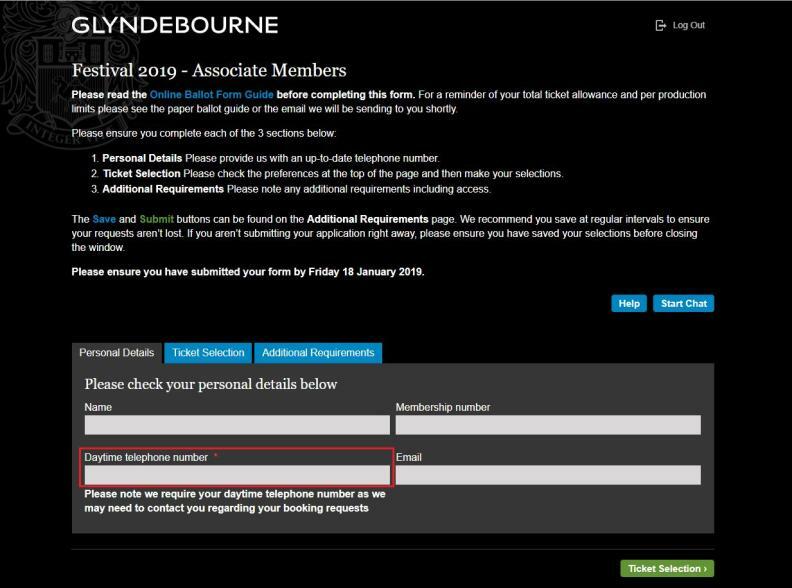 To revisit your application, please go to onlineform.glyndebourne.com enter your email address and password, then click ‘Log in’, this will load your saved entry. If you aren’t submitting your application right away, please ensure you have saved your selections before closing the window. Please save your form at regular intervals to ensure your requests aren’t lost. When you are happy with your selections, you can submit your completed application. Please note that once submitted, no further changes can be made. Once you have submitted your application you will receive an email confirming your booking requests. If you do not receive this confirmation, please contact the Box Office.